I have in my possession two old photographs featuring gas lamps in Hebden Bridge. 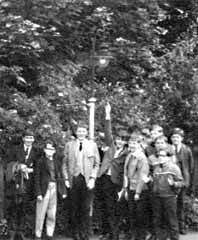 Photo number one dates from June 1967 when the approach to Hebden Bridge Railway Station was still lit by gas. Photo number two dating from July 1963, was also taken in Hebden Bridge although its exact location is uncertain. Perhaps a “Milltown Memories” reader could identify the spot? 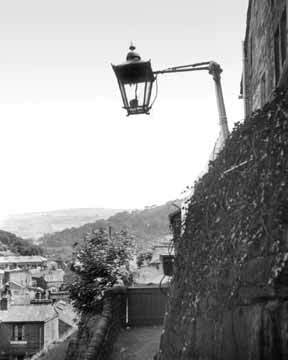 Like many lamps in Hebden Bridge the lie of the land resulted in unusually-mounted lamps such as this one. On December 20 last year I lost an old friend. Michael Kilroy was a gentleman, with the emphasis on “gentle.” He was also the most naturally humorous man I ever met. I shall remember him with affection – gone but never forgotten. I must comment on the letter from H. M. Harrison (issue 10) and say that it saddens me when people take it upon themselves to adopt such an unhelpful stance. “Milltown Memories” is a vital asset in perpetuating the cultural and historical resource of the upper Calder Valley, a knowledge that is in danger of being forgotten with the passing of a generation. The magazine provides a forum for the preservation of our heritage and should be appreciated as such.